Providing virtually every health care service that residents may need throughout their lives, the Hospital is focused on continuously enhancing its services and technologies to ensure that the community’s health needs are met. The Hospital offers a comprehensive array of high-quality inpatient and outpatient services, including advanced cardiovascular services; specialized care for women and children; oncology services; orthopedics; emergency care; urgent care; and psychiatry and mental health services. For a complete A to Z listing of all services available, click here. 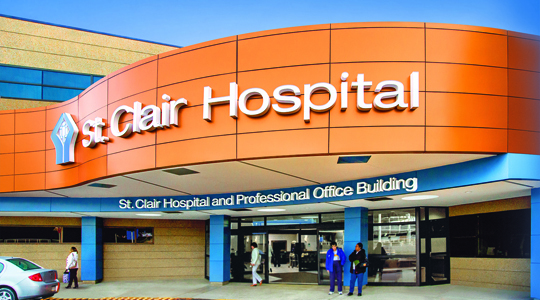 St. Clair is a top decile performer in patient safety, clinical outcomes, patient satisfaction, and value. A member of the Mayo Clinic Care Network, St. Clair is driven by its culture of continuous improvement. In 2018 the Hospital earned its twelfth consecutive ‘A’ grade for Hospital Safety and ranks at the top in patient satisfaction throughout the nation. St. Clair has once again been recognized as one of nation’s 100 Top Hospitals. This marks the third time St. Clair has achieved this prestigious honor since 2012. With its main campus in Mt. Lebanon, the Hospital also offers health care services at five outpatient centers, including diagnostic centers in Peters Township and at Village Square in Bethel Park. St. Clair accepts all major insurances. Click here to find a St. Clair location near you. Let us show you how we’re advancing patient care in the region by viewing the short video below.